Are your dancing boots ready? You’re going out to a party! The reels of this new offer from Real Time Gaming, Shanghai Lights, are set amongst the sky scrapers and hottest clubs of the Pearl of the Orient. This game features replicating wilds, free spins and a very lucrative Super Spin! Befriend the elite of the city and join them for a drink and a spin of the reels in this flashy, glamourous new release. As is typical for many slots, Shanghai Lights pays from Left to Right, which applies to all the formed combinations, excluding the Scatter, which is depicted with a dragon coin. With 5 reels, 50 adjustable paylines and up to 50,000 times the line bet in a single spin, you know this is a a slot worth betting on. The Wild, represented by the game logo, only appears on reel 3 during the main game. Once it lands, it replicates to cover an entire reel. Meanwhile, three or more Scatters are necessary in order for the free spins to be triggered, but you will always be awarded five free spins, no matter how many Scatters landed. Free spins can, however, be re-triggered up to 5 times, leaving you with the option of spinning up to 25 times for free in a single round. During the free spins, the Wild symbol will only appear on reels 3, 4 and 5 and all wins that include it will be doubled, leaving you with tons of potential for amazing wins! Best of all, every time the free spins finish, the Super Spin Free Games feature begins! You will receive 3 Super Spins with plenty of Scatter Upgrades available, which are awarded depending on how many winning Scatter pays occurred during the free spins, earlier. There are six exciting Scatter Upgrades available, which include progressive win multipliers and transforming wild reels. 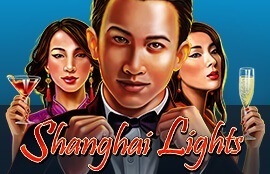 Check out all that Shanghai Lights have to offer with this slot available on Instant Play, Download and Mobile. You have the chance to make epic wins from wherever you are; at home, during your commute to work, or even out clubbing... Go ahead and try out our new slot at Jackpot Capital online casino today and see what this crazy night out brings you!